It’s a new year and a new trade deadline with a live-blog that will be your guide through this hectic and crazy day. What can you expect here? You can expect to find the latest news, rumors, breaking news and some analysis too. It’s going to be a good time, keep refreshing every hour or so, and enjoy the coverage by Pierre LeBrun, Barry Melrose, and Bob McKenzie who is at TSN’s studios for Tradecentre. Deadline is at 9pm EST Tonight!!! 12:01 pm Bob McKenzie: Hey everybody! Happy Trade Deadline Day!! 12:05 pm Barry Melrose: Greetings from the War Room! 12:08 pm Pierre LeBrun: Just finished my Red Bull… Let’s do this thing!!! 12:10 pm Barry Melrose: No trades so far. Just like in previous years we like to call this the calm before the storm. 12:15 pm Bob McKenzie: I feel like we pose this question every year – Is this the day Buffalo GM Daryn Beckman finally trades Crosby? 12:17 pm Pierre LeBrun: If I were Daryn I would trade him. There are GMs in this league that would overpay for Crosby so I think he could get a kings ransom. 12:20 pm Barry Melrose: Some big names on the block today include San Diego’s Nikita Kucherov, Hamilton’s Gustav Nyquist, and Pittsburgh’s Alex Pietrangelo. 12:17 pm Pierre LeBrun: Toronto GM Jordan Carbone says he’s willing to trade guys like Brent Burns, Erik Karlsson, and Gabriel Landeskog. 12:25 pm Bob McKenzie: I think Carbone is trying to shake things up to make the playoffs. Big race for 8th going on right now. 12:27 pm Barry Melrose: Carbone also wants to be the second GM in AFHL history to win two AFHL Cups. I think he’s got the horses to do it this year. 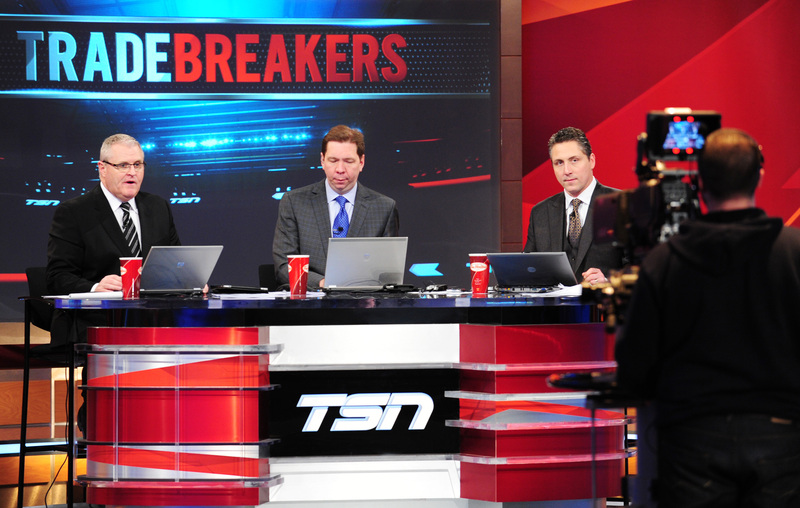 1:07 pm Barry Melrose: Who will be the first to make a trade today? 1:08 pm Bob McKenzie: Hearing Patrick Marleau most likely played his final game in a Phantoms uniform. GM Beckman wants to trade him today. 1:11 pm Barry Melrose: Darren Dreger is reporting Buffalo GM Daryn Beckman has just agreed to a trade. 1:15 pm Bob McKenzie: What is the trade? 1:17 pm Pierre LeBrun: One of my sources is telling me he traded Crosby!!! 1:22 pm Bob McKenzie: Well here we go guys! First trade of the day is made by Manhattan GM Tony Furino and Washington GM Rick Charron… Bobby Ryan is on his way back to Manhattan and prospect John Quenneville is off to Washington along with a 2019 Second Round Pick (Toronto). 1:24 pm Barry Melrose: Interesting trade. Bobby Ryan was originally drafted by Manhattan in the 2nd Round of the AFHL’s Inaugural Draft exactly 10 years ago. 1:35 pm Pierre LeBrun: EJ Hradek is at Buffalo Phantoms practice. Says all guys are on the ice except for Patrick Marleau. 1:38 pm Bob McKenzie: I think that first trade has woken everybody up. I’ve been told GMs are starting to get more aggressive in their talks. 2:03 pm Bob McKenzie: LOL Henley is a funny guy. 2:05 pm Pierre LeBrun: That Buffalo/San Diego deal has just been finalized. Patrick Marleau and a 2021 Third Round Pick to the Gulls in exchange for prospect Jonah Gadjovich. 2:06 pm Bob McKenzie: Marleau fits into the San Diego offense as they try to bolster for the playoffs and win a third straight Stanley Cup. 3:06 pm Bob McKenzie: All is quiet right now although guys are about to start getting off of work. 3:40 pm Pierre LeBrun: Yeah it usually picks up after work hours. 4:59 pm Barry Melrose: TSN reporting the X-Men and Supermen are on the verge of a deal. 5:29 pm Bob McKenzie: Lots of talk in Toronto. GM Carbone still fielding offers on guys like Brent Burns and Gabriel Landeskog. Almost three more hours until the deadline. 6:31 pm Bob McKenzie: Manhattan GM Tony Furino just announced Blake Wheeler is on the block. 6:42 pm Barry Melrose: Laval forward Jonathan Toews says trade deadline is nothing but stress, tension and awkward goodbyes. 7:02 pm Pierre LeBrun: The Toronto Red Devils have traded Gabriel Landeskog and a 2019 Third Round Pick to the Deer Park Chiefs for Matt Dumba, Jack Roslovic, and a 2019 First Round Pick. 7:08 pm Bob McKenzie: Whoa, that is quite a trade. 7:20 pm Pierre LeBrun: I’ve been told Atlantic City and London have struck a deal. 7:22 pm Pierre LeBrun: Tyler Bozak is off to Atlantic City. Juuso Valimaki is on his way to London. 7:29 pm Barry Melrose: Told Moncton and London are completing a trade, one is close/near done. 7:31 pm Barry Melrose: Moncton acquires Andre Burakovsky, Isaac Ratcliffe, Matthew Strome, and Nicholas Merkley. London acquires Nazem Kadri, Mario Ferraro, Logan Stanley, and Dmytro Timashov. 8:01 pm Pierre LeBrun: ONE MORE HOUR UNTIL THE TRADE DEADLINE!! IT’S GETTING INTENSE OUT THERE!!! 8:07 pm Barry Melrose: Manhattan and Comox Valley have finalized a deal. Will Butcher is heading to Manhattan. Gustav Forsling and Marcus Pettersson are heading to Comox Valley. 8:08 pm Barry Melrose: Hearing Toronto has made another trade. 8:10 pm Barry Melrose: Toronto has traded Tom Wilson to Comox Valley for Malcolm Subban and Alexander Nylander. 8:31 pm Bob McKenzie: Lots of activity now down the stretch with 30 minutes left!!! 8:49 pm Pierre LeBrun: Hearing the Hamilton deal is for Gustav Nyquist. 8:54 pm Bob McKenzie: Everybody’s cramming!! Last minute rush!!! 8:56 pm Barry Melrose: Pierre McGuire is telling me the Manhattan/Toronto deal is on hold. Apparently one side wants a throw in pick and the other side doesn’t. Looks like it’s going to come down to the final minute. 9:26 pm Barry Melrose: We are exhausted. Too many trades to post here at the end. We saw a total of 19 trades made today. That is an AFHL record. And there were about 15 trades made in the final hour and about 10 of them were buzzer beaters in the final minute! Amazing trade deadline!! Great job everybody!! Goodnight! !